Mobile traffic, mobile websites, mobile apps. These and similar phrases are increasingly being discussed in SEO circles, but sometimes (and I am as guilty of this as anyone) we forget to define what we actually mean by the term ‘mobile’. But to the average person (at least here in the UK), ‘mobile’ is a synonym for ‘cell phone’. No one says, ‘let me look it up on my mobile’ and then takes out an iPad. Tablets, smartphones and feature phones are all very different devices, and encourage different behaviours, and therefore require different marketing approaches. The gap is certainly narrowing between tablets and smartphones in terms of size variations, as we increasingly see wider ranges in both types of product. But the ways in which we use tablets are not necessarily the same as the ways we use our smartphones, and a feature phone is a completely different beast. So why are we still lumping them into the same unwieldy category of ‘mobile’? Some might argue that it’s because tablets and smartphones, while not the same thing at all, are still more similar to each other than they are to a desktop. But tablet visitors often behave more like desktop visitors than like smartphone visitors; if anything, tablets seem increasingly to be used as a quicker alternative to the laptop. A study in March 2013 by Ebay found that tablet shoppers spend £154 on average compared to £85 on smartphone. In Dec 2012, data from Affiliate Window, reported by Econsultancy, showed iPads accounting for 55% of mobile commerce, “compared to 29% on iPhone and 13% on Android devices”. A study by YuMe showed 38% of respondents accessing entertainment content on their smartphone vs 28% on tablets. Compare this to the Adobe Digital Index data where consumers preferred tablets to smartphones for accessing retail and ecommerce sites. And even Google Analytics is recognising the difference, with a new version of their default mobile segments which allows you to differentiate ‘Mobile’ and ‘Tablet’ traffic. I’ll be honest. I don’t know what the whole solution is. But there are some things for us to think about going forward. I’d certainly like to see us be more specific in our discussions of ‘mobile’. The language we currently use is too vague. For example, when we talk about ‘mobile marketing’, do we mean a smartphone-accessible website or SMS promotions? When we talk about a ‘mobile strategy’, do we mean adding click-to-call numbers to our site? Or do we actually mean a strategy for a multiscreen consumer journey? One thing which all of the above stats have in common is a focus on user behaviour. So an approach that could be useful is to start thinking in terms of ‘intent’ and ’behaviour’ rather than ‘device’. With this approach, a ‘mobile’ interaction would be one which takes place when the user is not at home or work, but out and about, and a ‘mobile strategy’ would be one which addressed the needs of users for those types of interaction. But we do see certain behaviour patterns which are based on the capabilities of the device, so we can’t completely separate device from intent. And this emphasis on intent is something we should be looking for in all online interactions, not just mobile ones. Each of these devices differs from the others more than we might imagine at first glance. And yet each of them needs to be able to work together with the others seamlessly, because consumers no longer use a single device for everything. In fact, we increasingly use multiple devices throughout the day, sometimes for the same transaction. As SEOs, we need to stop desperately scrabbling to keep up with every new device and browser and OS out there, because we’ll never catch up. While it is obviously important to remain aware of new developments, our ultimate goal as mobile marketers should be to develop approaches which integrate multiple screens and devices more effectively and make that ‘seamless experience’ possible. We also need to have a more granular approach to the data, especially user behavioural data, and actually work to understand how people use these devices. If we bring together all of these things, I think we can begin to develop a deeper and more insightful appreciation of our ‘mobile’ audience and what they need from us. What do you think about the current use of the term ‘mobile’ in digital marketing circles? Is it useful as a blanket term, or should we try to differentiate more between different devices? And is there a simple solution? I love this line of thinking as you know. Did you see the stats from Think Insights (http://www.google.com/think/research-studies/creating-moments-that-matter.html) that 77% of “mobile” searches are done at home or work (where people presumably have a regular computer available to them)? Thanks Will! That’s a particularly revealing stat, but I’m a big fan of all the Think Insights mobile stuff, there’s some really useful information there for anyone who’s interested in these sorts of topics. That’s the same in the U.S. Most say cellphone, smartphone or mobile when they mean phones and no one calls a tablet a mobile device. Apple-dominance has gotten most North Americans to call all MP3 players “iPods” and all tablets are “iPads” even when it’s clearly a non-Apple product. Nice content on mobile marketing ..Mobile searches and mobile usage is increasing day by day.. Thanks for highlighting that our focus should still remain on understanding user behavior patterns and , i couldn’t agree more. The picture you found is a great overall summary of the task at hand to develop on multiple devices now and in the future. 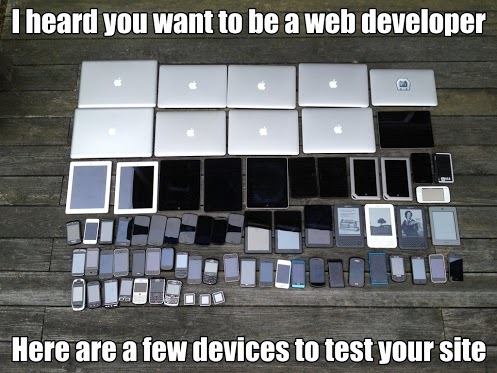 For a web-site to work perfect on all devices it would take a huge amount of testing. Multiple device web development is fact of life now and the online activity has rocketed. The future of mobile development is looking bright, but on the other hand the more devices released the harder it is going to be to develop for. If we think back just a little bit. How online marketing has changed over these few years and who knows how it will change in the next 5 years. Definitely the future for mobile development is looking bright.